Google Beba Pay: Is Kenya Ready For Public Transport Debit Cards? I am a big fan of ICT; especially as an enabler in emerging markets. That is why I was excited sometime in 2012 when Google announced their solution to carrying coins as fare in your pocket. It is the Beba Pay Card that is to enable daily commuters to pay from a debit card. So when Kenya’s very own deputy pres. Ruto announced that he was commissioning the Google Beba Card, I was excited because it not only moved us closer to Vision 2030, but it also went to affirm our faith that the new government is embracing ICT. The initiative is in conjunction with Equity Bank, one of Kenya’s largest footprint banks whose model of attracting the low income mwananchi has placed them among one of the largest customer base banks in Kenya. It is run by Dr. James Mwangi, crowned Africa Forbes Person of the Year, 2012. Brilliant man he is. I sat and watched during his acceptance speech how he borrowed about 300 Million KES from Mr. Muguku aS Equity’s startup capital anyway, I digress. Back to the card solution – the Beba pay card is meant to revolutionalize the transport industry in Kenya which is currently chaotic and has been the root of some genius Kenyan trending topics like #CarPoolKE. Let’s us be honest, Kenya currently has a poor road network. Not so much can be said about the rail network either. It is currently much easier, and safer, for a CEO to take his own car and sit in traffic for 2 hours as opposed to sitting in a train or bus and catching up on his sleep there. Why? Because the guys who sit at the top find it hard to identify with common mwananchi problems. The card is a great idea. I was lucky enough to travel to Europe where I used a card exactly like this one extensively both on the train to and from Rotterdam and on the buses in Amsterdam as well. The cards work on the principle of debit where you pay an amount and get allocated ‘minutes’ according to the amount you have paid. Get on a bus, check in when you enter and check out when you drop off. Simple enough. Reason being they want to pocket some of the money that will be collected as fare. Perhaps they do not earn enough. Perhaps they are just greedy. As for the cops, let us not even got there. What would have happened had I not carried paper money? Your guess would be as good as mine. That really got me thinking as to how this is going to be implemented. Are we putting the cart before the horse with this technology? Is it too early? I need to say here that I am no transport-logistics expert but everyone would agree that fixing the basic transport infrastructure would be the first thing to do. How? Fix the roads. Then Fix the buses. Then Pay the staff (drivers, conductors and policemen) well so they won’t be so eager to steal from the system. Then make it so expensive to enter and park in town that people opt to leave cars at home. I am eager to see this Google Beba Pay card implemented say 5-6 years from now. When Dr. Mwangi and I are both seated in a Hoppa and I coerce him to pay my fare. 5-6 years from now my pal Kiragu, who sells ladies’ sweaters in Ngara, will not have a problem depositing 2,000 KES in his card so he can use for his monthly commute. He currently cannot do this because it is too expensive. He’d rather pay the daily rate of 80 bob to and from Jericho near Buruburu than invest in a monthly plan. Perhaps if Equity, and Google, incentivize him with a free commute twice a week, he will sign up. In 5-6 years. I don’t know, I am just saying. Same applies for Daniel Owira (the Otonglo Boy) who “lives in Kibera and works in Industrial Area”. Get him and his peers signed up and you will have won. Make the card so secure that if mine gets stolen, it won’t matter much; either because I will find it cheap to replace and move on with life or because the thief cannot use it fearing that he will leave a digital trail that can get him traced and busted. Raw ideas eey? I am just saying! 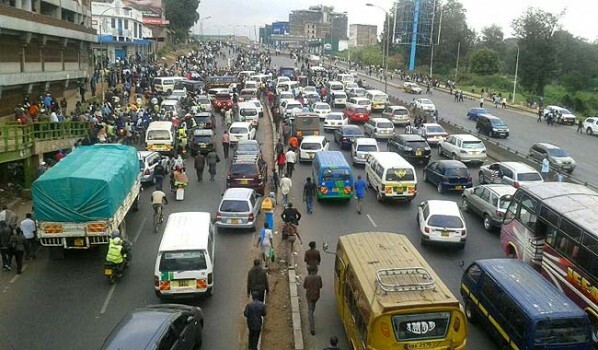 Another question I was asked by Jimmy Gitonga (@afrowave) when I asked him what he thought is this – Are Double M (currently the most organized and arguably the most profitable transportation company) in the system or is it just City Hoppas? Double M is relatively expensive but people (read my mum) still pay because its system works. This is the same reason we are addicted to M-Pesa despite the charges (and the recent increase in charges because government demanded they pay tax). Your thoughts are most welcome in the ‘Comments” section below. I love the article. It is not only easy to follow, but it also tells the story from a very interesting and informed perspective.